An exceptional c. 1652 map of Europe by Jan Jansson. 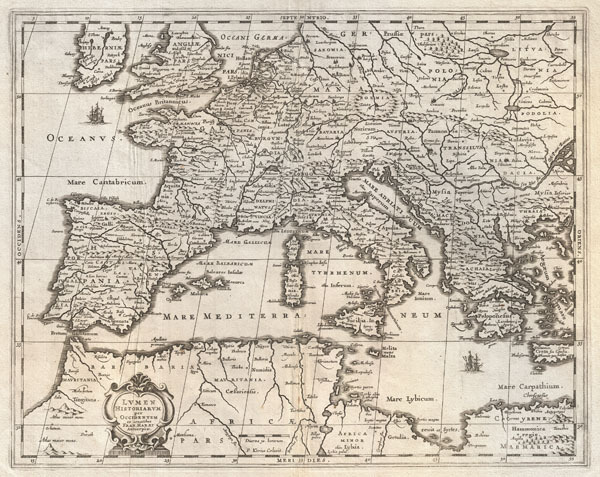 Centered on Italy, this map covers from Spain to Greece and from England to northern Africa. Designed by Frans van Haren (Haraeus), a Dutch theologian and globe maker active from about 1615 to 1624. Depicts Europe as know to the Ancients. Cartographically this map exhibits heavy influence from a very similar map of the same name published by A. Ortelius in his 1597 Parergon. Based on Greek and Roman sources including Pliny, Strabo, Virgil, Caesar, and others. Ships and monsters decorate the seas. A decorative baroque title cartouche appears in the lower left quadrant. This remarkable map was published in volume six, the Orbis Antiquus, of Jan Jansson's Novus Atlas. Jansson, J., Novus Atlas, Sive Theatrum Orbis Terrarum: In quo Orbis Antiquus, Seu Geographia Vetus, Sacra & Profana exhibetur, Volume 6, 1657. Very good. Original centerfold exhibits some wear. Some creasing passing through the left hand side of the map. Could use professional flattening - priced to accomdiate. Else quite clean. Van der Krogt, P. C. J., Koeman's Atlantes Neerlandici, 0822H:1.